Disclaimer: A local MD collector lent me two MZ-RH1s in order that I could publish my opinions here, at YouTube, and also for a hi-res photo of the above. Many thanks, Rok. And, by and large, it still does. No other MD recorder had as many built-in features. No other recorder with a realtime recording feature set measured as well. But the RH1 isn’t as solidly built as the MZ-NH3D, the MZ-R50, or the MZ-B100. While the RH1 hisses drastically less than the R50 and somewhat less than the NH3D, it can’t regulate a loaded signal as well as either. Its stereo image collapses and its frequency response drops off. Still, its sound enhancement engine is good, featuring a well-rounded EQ, dynamic normaliser, and environment-induced echo emulator. Unfortunately, like all modern Minidisk players, it is less powerful than an iPhone and unable to come close to the 16-bit ceiling. In MD land, it is one of the best-performing units. In the greater world, it is far, far behind even mid-range and entry-level players like the Fiio M6, FiiO M3, the Onkyo DP-S1, and Cowon Plenue D.
Its buttons are hard to press, in awkward locations, and tiny. The few buttons that are large, are loose, too easily engaged, and weak. The battery compartment stays shut reasonably well, but is hard to both open and close, and isn’t as tightly battened down as the NH3D’s. It bears a striking family resemblance to Sony’s prettiest recorder, the MZ-R37. It isn’t brutish or awkward. It’s OLED screen is easily readable in any indoor light, and nearly impossible to read in direct sunlight. If you’re int the market for a recorder, the MZ-RH1 is unmatched in features and overall recording performance. The list of qualifying provisos to that praise is equally impressive. The RH1 is chock-full of features. It looks good, plays well, and is crafted partly for the future, partly for the past. But it’s not that solidly built, nor does it measure as well as certain other MZ MD Walkmans. It sounds good, and only barely hisses when hooked up to modern, super-sensitive earphones like Hidizs MS1 and MS4. But ultimate sound quality is not the reason you’d pick one up. 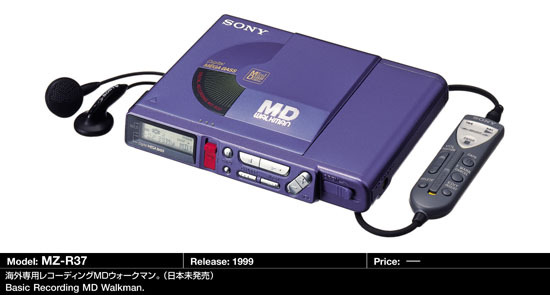 You’d pick one up to own the last-gen Sony MD Walkman decoder, or to upload your favourite old MDs to your computer, digitally, and with all their titles and track marks in place. All in all a good, but not great recorder.